Saleswoman Li Li stood in a booth at the Canton trade fair, surrounded by luggage decorated with floral, leopard and news headline prints like "credit crunch" and "economic disaster looms." She pointed to one that said "dollar exchange rate" with a chuckle. "We're all worried about the exchange rate," said Li, whose Globalway Luggage Co. is based in the eastern port city of Ningbo. "If the exchange rate changes, it will really eat into our profits. It's basic economics: our products will be more expensive overseas and less competitive," Li said. After nearly two years of keeping its currency stable against the U.S. dollar to help exporters like Li weather the global financial crisis, hopes had revived overseas that Beijing might relax the dollar peg soon. But as the European debt crisis deepens, China is signaling it will hold back on any changes — a stance likely to complicate high level talks next week with the U.S. 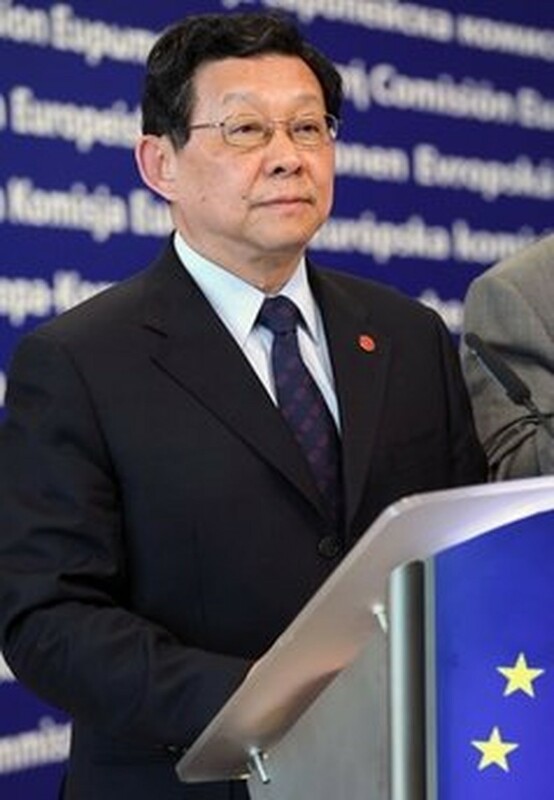 The latest, most authoritative comment on that came from Commerce Minister Chen Deming, who told reporters while visiting Austria this week that Beijing intends to keep the yuan stable. Meanwhile, U.S. Treasury Secretary Timothy Geithner confirmed that the contentious currency issue is bound to be on next week's agenda. "I think it is, of course, China's decision about what to do with the exchange rate — they're a sovereign country," Geithner said. "But I think it's enormously in their interest to move, over time, to let the exchange rate reflect market forces, and I'm confident that they will do what's in their interest," he said while visiting Boeing and other exporters in Washington state. China reported a $196 billion global trade surplus last year, adding to pressure to tilt its economy toward greater reliance on domestic demand. With the Greek debt crisis has come a weaker euro, and a relatively stronger dollar-pegged yuan, "which should reduce the volume of complaints from Brussels on Beijing's exchange rate policy," says Tom Orlik, an analyst in Beijing for Stone & McCarthy Research Associates. Even if the euro's drop to near four-year lows against the dollar alleviates pressure from European trading partners, President Barack Obama has vowed to take a tougher line with Beijing over its controls on the yuan as the U.S. heads toward crucial mid-term elections. Opinions vary, but economists say that depending on how it is measured the yuan is undervalued by up to 40 percent against the dollar. Fred Bergsten of the Peterson Institute for International Economics estimates that bringing the yuan's value up by that amount could generate some 1.2 million U.S. jobs. That would go a long way toward meeting Obama's recent pledge to create 2 million jobs, while doubling exports over the next five years. Chinese policymakers insist that adjustments in the yuan's value will have little direct impact on the trade balance with the United States, and some fret that the yuan's nearly 15 percent gain against the euro is already too great a burden. "A revaluation would not bring any good to our economy, as our exporters already are under heavy cost pressures. It would be dangerous to revalue," said Yi Xianrong, an economist at the government-run Chinese Academy of Social Sciences in Beijing. Yet, a growing number of Chinese experts argue that Beijing does need to move faster on long-standing pledges to loosen exchange rate controls, for the sake of its own economy. By clamping down, they say, China is limiting its options at a time when the economy appears on the brink of overheating, expanding nearly 12 percent in January-March while housing prices surged to record levels. "A more flexible currency rate will do good to both ourselves and the world economy," says Mao Yushi, a prominent reformist economist. "It is a difficult process though." Because of China's large trade surpluses, the central bank intervenes heavily in the exchange market, buying up excess foreign exchange earnings to keep the yuan's value from rising. This has driven China's foreign exchange reserves to a record $2.45 trillion while pumping more money into the economy, pushing prices higher. With China's economy growing at double-digit rates, boosted by 4 trillion yuan ($586 billion) in stimulus spending and record bank lending to finance construction projects, Beijing can afford to move faster, some say. Zhang Bin, an economist at the government-run China Academy of Social Sciences, forecast that a 10 percent rise in the yuan's value would cause a 3.3 percent drop in exports. That would pose no great threat, he said in a recent edition of the magazine Oriental Outlook. Not all American companies favor pushing for a stronger yuan. Executives of multinationals with big operations in China tend to favor keeping currency rates steady. "The stable yuan is obviously easier for managers to cope with," says Kevin Wale, president and managing director for General Motors China Group, which sources 85 percent of its parts locally. For Pu Fangqiong, a purchasing manager for a Shanghai textile exporter, a stronger yuan would be painful. "The currency appreciation is only a part of it. Pressure is coming from rising costs for raw materials and labor," she said. "We just hope it won't get any worse." For many Chinese companies, adjusting to a stronger yuan would involve trying to climb the "value chain" to produce more expensive products or by selling more inside China. "The answer is to try to sell more to the domestic market. The yuan's appreciation is inevitable and you cannot survive unless you are well prepared," said Zhang Yizheng, general manager of auto parts trader Shanghai Ruisheng Industrial Trade Co.
Zhang's company has benefited from China's surging auto sales. But for most exporters, going local is tough given the fierce competition from both Chinese and foreign companies fighting for a piece of the only booming major market around. "We want to have our own label and create our own unique products, but that's hard to do," says Wang Zhansheng, whose Beijing-based company, China Tong Yuan Co., makes tote bags and purses for export. "You have to take customers out to lots of dinners and sometimes even pay bribes to get an order," he said.